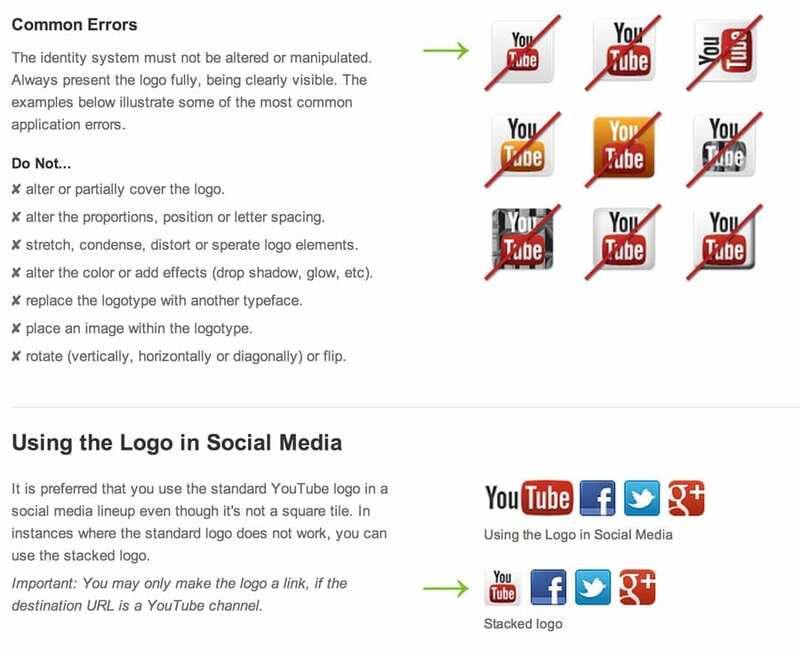 YouTube provides vector versions of its logo, along with a bunch of funny rules and contradictions within those rules. Graphic Designers can be silly that way. Take a look at the two green arrows I added to this screenshot of those rules posted to YouTube’s website. Don’t put the logo in a white button-style box, unless you’re putting it in a white button-style box next to other social media links? Perhaps if the designer would have taken more time creating a solid EPS version of the logo for download instead of one that can’t be ungrouped in Illustrator and therefore can’t have a transparent background, well anyway…enough trashing some guy I’m sure is just doing his best to keep the Googleverse looking good. Still, the EPS version of their logo can’t be easily used as an SVG icon due to the way it was created and combined and what not. So…, I went ahead and created one on my own. This vector, SVG YouTube logo can easily be imported into Icomoon for use as an icon font. Enjoy!